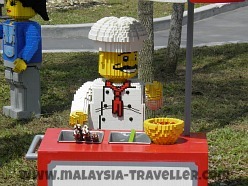 Legoland Malaysia is a world-class family theme park in Johor. 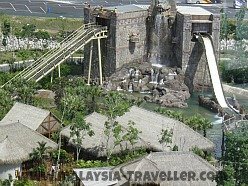 It opened in September 2012 and is Legoland's first theme park in Asia. It covers 76 acres and has over 70 interactive rides and activities. The park is designed for kids aged 2 - 12 but adults and older kids find it fun too (I certainly enjoyed it!). We had already visited Legoland Windsor (in UK) so we knew what to expect as most of the attractions are similar or identical. Miniland here portrays Malaysian and Asian landmarks whereas Windsor's version has models from UK and Europe. 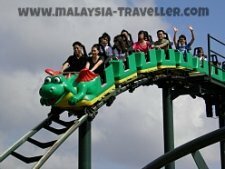 Malaysia's Dragon roller-coaster is better than the UK version (according to my daughter). Malaysia is much hotter but rain can be a problem. 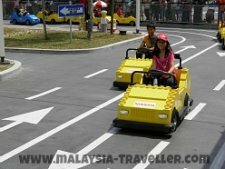 Overall, my daughter prefers Legoland Malaysia. Here you can find Lego Academy and Lego Mindstorms. These are rooms with plenty of Lego bricks and Technic pieces for kids to get their hands on and build stuff. No Ranking - Not my daughter's cup of tea so we didn't spend time here. Project X is an 18m high roller coaster with steep inclines and sharp bends. Ranked 2nd best attraction in the park. Aquazone Wave Racers is a fast spin round in a skimming above water. Moderate splashing expected. Ranking - Fun! Technic Twister is a fairly standard spinning fairground attraction. Ranking - OK. The highlights in this zone are the two roller coasters, The Dragon and, a milder version, the Dragon's Apprentice, ranked 1st and 3rd respectively. Other attractions include Merlin's Challenge (an up and down carousel - ranked Good), Royal Joust (a tame simulated horse ride for younger kids) and Forestman's Hideout (a kid's playground with slides, bridges and so on). Here we watched a 4D Movie called Spell Breaker which is one of 3 films that are shown in rotation. It was enjoyable and a chance to rest in air-conditioned comfort for a while. Also in this zone is the Observatory Tower which provides a revolving 360 degree view of the entire theme park from a height of 50 metres. 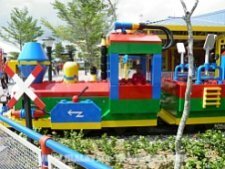 Other attractions here include the Kids' Power Tower, Duplo Playtown and Duplo Express (a mini train ride) which are aimed at toddlers and younger kids. Fun activities here include the Lost Kingdom, which is an indoor ride on which you get to test your shooting skills using laser blasters, and Dino Island (photo left), a log flume ride which you should only go on if you don't mind getting soaked. This is probably my favourite part of the park. 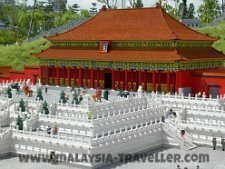 It is a number of beautifully made scale models of famous Asian landmarks, all built from Lego bricks. 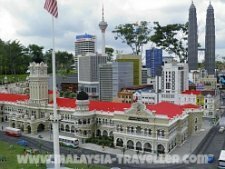 The buildings replicated in Lego include Petronas Towers and KL Tower, Sultan Ibrahim Building (Johor Bahru), Fullerton Hotel and Clarke Quay (Singapore), Taj Mahal, Great Wall of China, Angkor Wat and many more. This popular zone includes Rescue Academy where families race each other to put out 'fires' in a burning building, Boating School (battery powered boats), Legoland Express (train ride around the park) and the Driving School where children can acquire and road safety skills while driving battery powered cars around a road layout complete with traffic lights, road markings and traffic signs. On completion of the driving lesson children can obtain a driving license with photo for an additional charge of RM25. Tip # 1. I recommend arriving early (by 10am) to beat the rush and start with most popular rides first (the roller coasters) when queues are short. That way you can spend less time in queues and more time on rides. Tip # 2. Bring a foldable umbrella. The chances of short but heavy showers are high, especially in the afternoon. This section can be enjoyed separately or together in a combo ticket with the main park. It has more than 20 waterslides and attractions including the Joker Soaker, Build-A-Raft and the Lego Wave Pool. There are plenty of shops scattered around the park selling Lego sets, gift items, snacks and drinks. Dining outlets include Pizza Mania, Market Restaurant and Jungle Café. 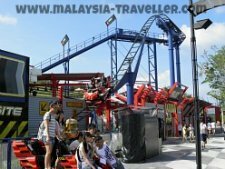 Legoland Malaysia is open every day. The usual operating hours are from 10am to 6pm with extended closing time at weekends and public and school holidays. From time to time rides are closed for routine maintenance. To avoid disappointment it is better to check on Legoland's official website to ensure all rides are working on your proposed date. It is a good idea to book in advance. Not only are the tickets cheaper but at peak times they might close the ticket sales counters to walk-in customers without advance bookings. 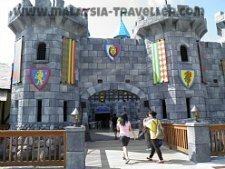 Legoland Malaysia is located in Nusajaya, part of the fast developing Iskandar region of Johor, just across the Straits from Singapore. The area is well served by expressways, being close to the Second Link crossing to Singapore and connected, via the E3 Expressway to the North South Expressway. If you are driving from the Kuala Lumpur direction, exit the North-South Expressway at interchange 253 and take the E3 Expressway. Exit the E3 at the Gelang Patah Interchange 312 and follow the signs to Legoland. There is plenty of parking (free at present). 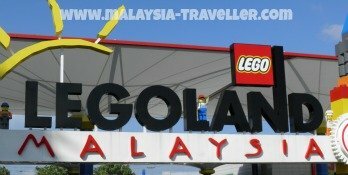 There are a number of bus services connecting Legoland to JB and Singapore. You can find the details here. 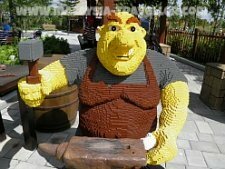 Legoland is a big park and you might want to avail yourself of a 2-Day Pass, especially if your kid is the sort who likes to spend hours building Lego models. In that case you will need somewhere to stay. 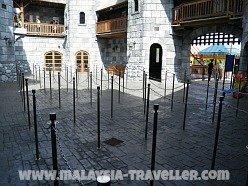 Legoland Malaysia has its own hotel with themed Lego rooms and special rates for 2 day passes plus accommodation are available. 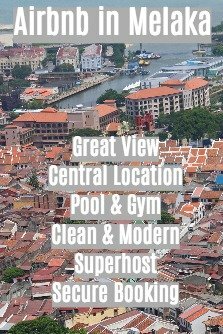 Alternatively there is a smart looking Jen Hotel next to Puteri Harbour Family Theme Park which is just a few minutes drive away. JB is only about 30 minutes drive away where there are plenty of hotels available. 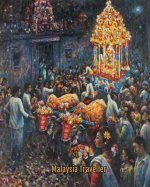 See Agoda's website by clicking here. 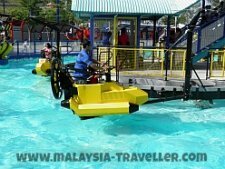 To see other nearby attractions in Johor state click here.